Full professor of Comparative law and Avvocato with rights of audience before the higher courts, Lorenzo Cuocolo specialises in administrative and regulatory law. He assists companies and public bodies in judicial and extrajudicial proceedings before the Regional Administrative Court (TAR), the Council of State, the Constitutional Court and independent authorities. 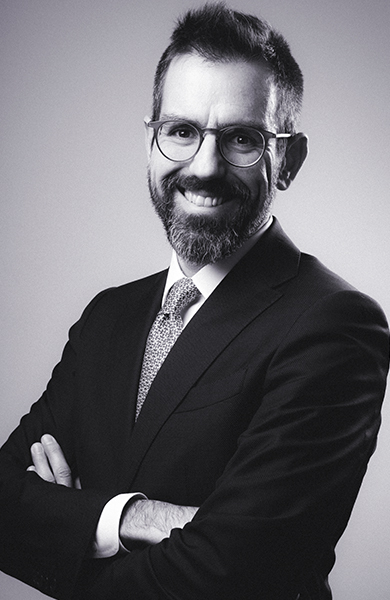 Avvocato since 2002 and qualified to appear before the Court of Cassation since 2010, he has worked in major Italian law firms as an administrative law specialist. Partner of CastaldiPartners, Lorenzo Cuocolo is also founding partner of Cuocolo studio legale, based in Genoa, a structure independent of CastaldiPartners though linked by an almost ten-year-long collaboration. Lorenzo Cuocolo has extensive experience in public procurement, energy and environmental, public service and local authority law, as well as in the field of ports, health, pharmaceuticals and food safety. In addition to assisting leading companies and important professional associations, he has been consultant to the Presidency of the Council of Ministers and the Ministry for Economic Development in Italy. He has assisted many Italian Regions, other public bodies the Council of Europe. Lorenzo Cuocolo works in English, French and Italian. Assisted public administrations, companies and groups of companies in the judicial settlement of disputes concerning work tenders, supplies and services. Assisted large private groups in relation to State property concessions. Assisted different entities in the judicial or extrajudicial settlement of disputes relating to public services. Assisted Italian and foreign companies in the preparation of administrative and environmental due diligence reports. Coordinated due diligence exercises in connection with major construction and urban planning projects. Member of the Local Public Service Authority of the Municipality of Genoa. Member or Chairman of the Boards of Directors of banks and financial companies, including listed companies. Director and Vice-chairman of port management companies and motorway companies. Defended Italian public bodies before the Constitutional Court. He is the author of more than a hundred legal publications – including many monographs – in Italian, French, English and Spanish. He is a regular speaker at conferences and seminars on public law, economic law, administrative law and comparative public law. Since 2003, he has been assistant professor at the Università Commerciale “Luigi Bocconi” in Milan. He is currently a full professor of Comparative Law. Since 2016, he has been teaching European and Comparative Constitutional Law at the Università di Genova and Public Law at the Università Bocconi di Milano. He has spent periods of study and research at Sciences Po Paris and the NYU School of Law.